These days, field service operations depend on the internet. 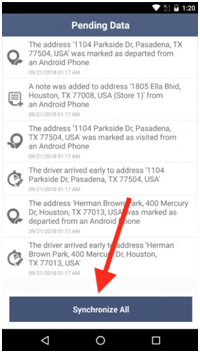 Your drivers might want to access routes on their smartphones while they’re on the road, or they might want to add a note about a stop into their route planner app. In most cases, performing these actions requires an internet connection. But it’s unreasonable to expect 100% signal strength all of the time, especially in the suburbs and in rural areas. And even in a city, tall buildings will sometimes block your connection. Your drivers can lose access to the internet at any time, which might cause them to get lost and miss the ETAs you provided to your customers. That’s why you need a route planner with an offline mode, and we have some great news for you – Route4Me’s Android and iOS apps both work offline! 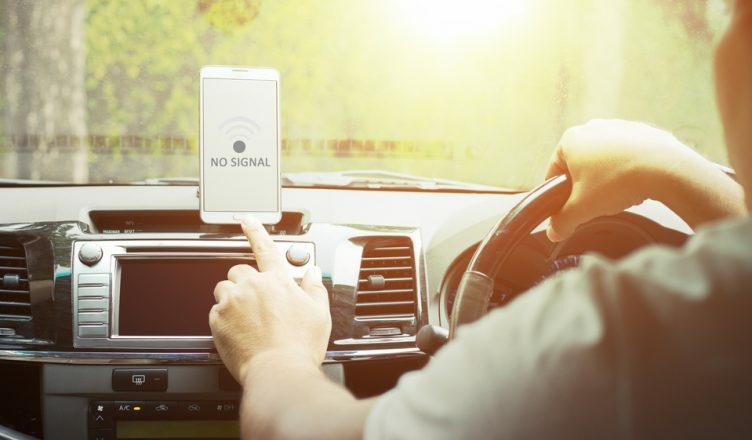 The purpose of this feature isn’t for drivers to use Route4Me offline all the time, but rather to help your drivers manage situations where the internet is unavailable for some reason. After a route is downloaded onto your driver’s device, it can be visited, routed, and navigated without an internet connection. Read on to learn more about how Route4Me’s offline mode works and which specific features can be accessed while offline. View a route and its stops and open it on the map. Send messages through the Activity Feed. Mark stops as Visited and Departed. Add notes of all formats, including text, image, and signature notes. Use the integrated voice-guided navigation (if included in your subscription plan) or a third-party voice-guided navigation app. 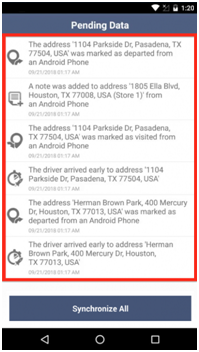 You can perform all of these actions offline on the Route4Me Android app as well, and you can also scan barcodes while offline on Android devices. Once the internet connection is restored, the data produced by the actions mentioned above will automatically re-synchronize with the Route4Me servers. You never need to worry about data synchronization when using Route4Me’s route planner app. 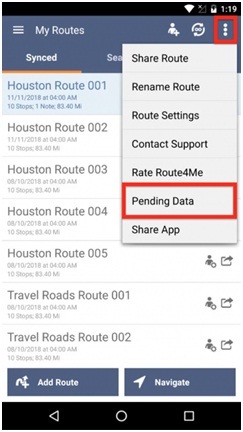 Even if your data does not synchronize automatically, Route4Me’s Android app gives you the ability to synchronize pending data manually. The Android device should be updated. The latest version of the Route4Me Android app must be installed on the device. Then, tap on the menu icon in the top-right corner of the screen and select “Pending Data” when prompted. You’ll see all the data that still needs to be synchronized with the servers, as well as details of the actions that were performed while the device was offline. 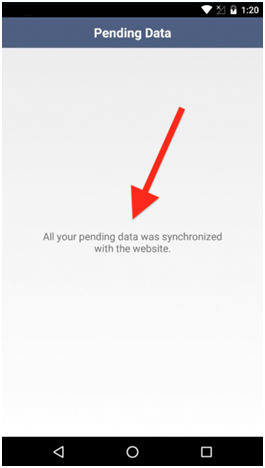 Select “Synchronize All” to sync the pending data. Once the synchronization is complete, you’ll receive a message confirming that the synchronized data will be available across all authorized devices associated with your Route4Me account. So, what do you think about Route4Me’s offline mode? Do you have any questions about this feature? Feel free to let us know in the comments section below.